It’s getting harder to keep up with blogging and touring. Most days, I am too tired to write anything, but there’s just so much exciting stuff going on, I can’t help but tell you about it. Delhi is home to a number of historic architectural monuments and I have visited a number of them, which I’ll tell you about in subsequent posts. However, nothing prepared me for the magnificence of the Akshardham Temple, making this a challenging post to articulate. Getting into Swaminarayan Akshardham Complex was really frustrating. Security was almost air-tight. Numerous gates, security cameras and endless warnings- No food, no drinks, no phones or cameras. So, you can imagine my irritation. I mean, if you can’t take pictures at a tourist site what are you even doing there? 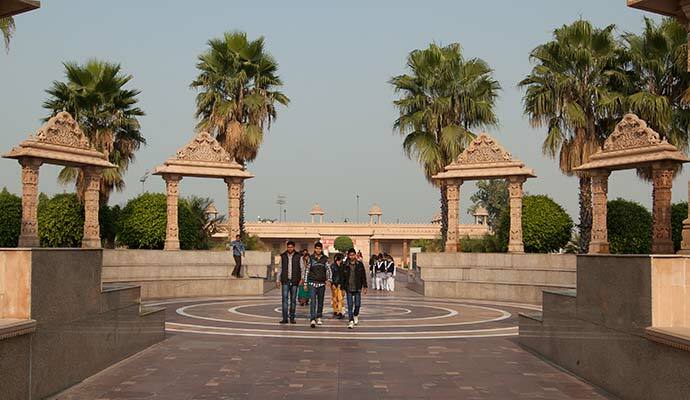 Nevertheless, I’ve included pictures in this post but all are credited to Akshardham Official Website. The queue to get into the complex seemed endless and the security women did a thorough job of searching all visitors. I have never been frisked like this, not even at international airports. This woman pressed, grabbed, pinched and palpated every inch of my body. By the time she was done, I felt quite violated. But, the trauma of being molested was quickly forgotten when we finally came to this entrance and I had a Halo Moment. You enter the temple complex through a series of intricately carved gates. The Bhakti Dwar (Gate of Devotion). Now, take note of how big those four gates are compared to the people walking down the middle. That’s the only way I can put you in the situation. I’m not sure you can see them but these 4 gates are fountains with water pouring down from the roof, much like a crystal curtain. It was so celestial, I proposed to my colleague and we planned a grand ceremony within that space. The show was a pleasant surprise. Walking from room to room, we were told the story of a boy – Nilkanth Varni (3 April 1781 – 1 June 1830), who became leader of the Uddhav Sampraday, and known as Swaminarayan . The story is told through staged life-sized mannequins on meticulously detailed stages. The lighting and stage design was remarkable and the synchrony between the mannequin’s movement and the story being narrated from the speakers was so perfect, it was easy to believe the mannequins could speak. Swaminarayan was a little boy who performed miracles and preached the message of peace and anti-violence. Being Christian, I found myself making comparisons between his and the story of Christ. Besides both being born poor, abandoning home, teaching and caring for the less privileged and dying young, there are some stark contrasts. Swaminarayan’s message was received by political leaders, Jesus Christ’s wasn’t. I still don’t know how Swami died but he wasn’t crucified for his message. But I’ll focus on their message with regards to life and its sanctity. According to the story, Swami rebuked a man for fishing and freed the fish the man had caught! Jesus on the other hand, filled the fishermen’s net with fish till they were breaking. Swami preached that ALL animal life is sacred. On the other hand, Christ supported the consumption of fish on numerous occasions and upheld only the sanctity of HUMAN life. With all due respect, I like Jesus take on food. The boat ride was a cruise through time and rich Indian history. The wooden boat swayed as we sailed along the narrow stream with cultural scenes staged and rushing by on either bank. India has a long history of enlightenment and civilization with blacksmiths, markets and hospitals during the Vedic period (or Vedic age) (c. 1500 – c. 500 BCE). They lay claim to discovering gravity before Sir Issac Newton, they claim to have discovered the geometry before Pythagoras, and as if that isn’t enough they claim to have made the first human attempt at a space expedition. I can’t expertly validate any of these claims but it will appear there is some truth to them and I’ve included links if you’d like to read more about this. I’ve never seen anything so imposing and terrifying in its enormity, yet so splendid. Its size, structure and intricate carvings are the stuff movies and nightmares are made of. Finding words to describe it all in detail is beyond me. Conversely, I’ve put a number of pictures in the slideshow below so that you get the idea. Inaugurated on 6 November 2005, the mandir is an homage to traditional Indian Hindu architecture. Designed in ancient traditional and middle-age medieval Indian style, the temple is surrounded by water and numerous golden fountains in the shape of ducks and cow heads. The mandir stands, traditionally and symbolically, on the shoulders of elephants, the Gajendra Peeth or Elephant Plinth, telling stories and legends of elephants with nature and people. The Akshardham mandir consists of 234 intricately carved pillars, 9 ornate domes, 20 quadrangled spires and 20,000 statues of India’s Hinduism’s spiritual personalities. The mandir reaches 141.3 feet into the sky, spans 316 feet in width, and is 356 feet long. The interior of the Akshardham Mandir -the sanctum, (‘Garbhagruh’) is divided into 9 mandapams or thematic spaces, filled with ornately carved murtis and pillars and topped by breath-taking domes and ceilings. I am obsessed with these ceilings. This was certainly the pinnacle of the Akshardham Experience. Again, this is a tough one to put in words. It all happened so quickly. Starting after sunset, the laser projector made moving,strobing beams of light in changing colors, that shown across the courtyard and through the rhythmic sprays, spouts and splashes of water being shot high up in to the sky in unison with the music. It was magical. If I ever have kids, I’m certainly bringing them to see this and since I can’t travel with you, I’ve included a short video. As we left the complex, I realized that Akshardham temple is most beautiful after dark and to sum this up, don’t leave India without paying a visit to the Akshardham Temple. Quite captivating, really enjoyed reading it to the end. Very well put together.